Increase your knowledge, be less frustrated and more efficient – and upgrade your résumé – with high-quality telecom training courses and telecom certification from the Telecommunications Certification Organization (TCO). CTNS Certification covers the core knowledge required by everyone serious in telecom today. The Certified Telecommunications Network Specialist courses will teach you the fundamental concepts and technologies of the telecom industry, the jargon and the buzzwords used in telecom, datacom and networking. Finally, you will learn how all of it fits together. CTNS Certification demonstrates you are up to speed on major topics including PSTN, Cellular, WiFi, Ethernet, LANs, IP packets, IP addresses, routers and IP networks, MPLS and Internet... a valuable thought to have in your manager or recruiter's mind. For employers, the online CTNS courses and TCO CTNS certification are a cost-efficient, consistent and effective way to ensure team members have the knowledge necessary for productivity and accuracy. CTNS Certification is obtained by passing 6 individual course exams, each course having 10 multiple-choice questions. It is accompanied by a personalized Letter of Reference outlining the knowledge you have and providing contact information for verification. The CTNS Certification Package Unlimited Plan includes the CTNS Certification Exam and six CTNS Courses with unlimited repeats – which means guaranteed to pass if you're willing to do the work plus refresh your knowledge anytime. CTNS Study Guide in print or eBook available. Completing the Certified Telecommunications Analyst Certification is the best way to show you have a very strong knowledge of telecommunications. 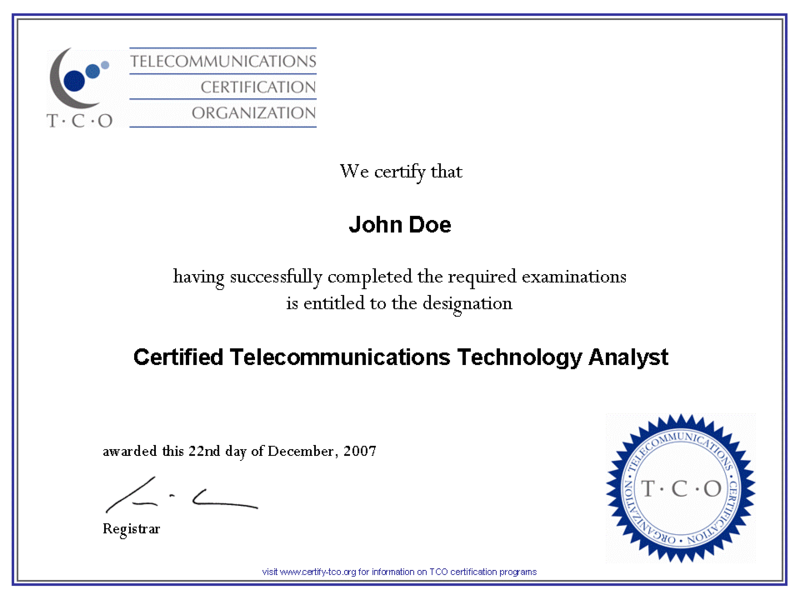 The CTA is the most comprehensive telecom certification available. CTA demonstrates both a deep and very broad knowledge of telecom, datacom and networking. This knowledge enables the CTA to perform analysis and make recommendations. Jobs like Telecom Analyst and a Subject Matter Expert typically pay more than coding positions. Your CTA Certificate is accompanied by a personalized Letter of Reference providing a detailed list of the knowledge you have. and DVD Package V530 Full Library. The Certified Wireless Analyst Certification from the Telecommunications Certification Organization covers the core technical knowledge needed in wireless today. As a CWA, you will be up to speed on the full range of wireless technologies, including fundamentals, spectrum, mobility, concepts and network technologies, LTE, WiFi and fixed wireless. CWA is obtained by passing the CWA Exam, which is 3 course exams, each having 10 multiple-choice questions. In addition to a Certificate, you also receive a Letter of Reference detailing the knowledge you have for inclusion in your CV. You will have the confidence to perform analysis, help make recommendations, write reports, and be a valuable contribution in a variety of business fields from project management to software design, sales, marketing and finance. The CWA Certification Package includes the CWA courses and Certification Exam, with unlimited repeats, meaning guaranteed to pass if you're willing to do the work, jump in and out of courses, and refresh your knowledge anytime. The Certified VoIP Analyst TCO-CVA courses and certification cover the many aspects of Voice over IP. This certificate explains the ways VoIP is implemented, softswitches and SIP and how calls are set up, digitizing and packetizing voice, factors affecting sound quality, carrier connections, SIP trunking, MPLS, Expedited Forwarding and network quality, Service Level Agreements (SLAs) and Class of Service (CoS). This certification is a specialization in VoIP and SIP. It builds on a base knowledge of telecom fundamentals. If you don't have the base, it is highly recommended that you do CTNS and its six courses first. There is a package deal for getting both together. This specialization certification highlights the fact you have broad and deep vendor-agnostic knowledge of VoIP systems and practices... which enables higher-paying positions in product and business development, being an analyst, writing reports and making recommendations as well as accurate and productive contributions in project management, business and product development, software design, sales, marketing and finance roles. CVA Certification is obtained by passing the CVA Exam, which is 6 individual course exams, each course having 10 multiple-choice questions. CVA includes a personalized Letter of Reference detailing the knowledge you have and inviting the recipient to contact us. The CVA Certification Package Unlimited Plan includes the six courses and the Telecommunications Certification Organization TCO -CVA Certification Exam, with unlimited repeats. You can do the courses at your own pace, jump in and out, guaranteed to pass and refresh your knowledge anytime. These courses build on IP and telecom fundamentals. If you are completely new to telecommunications, we recommend CTNS first to build a base. Check out the CTNS + CVA combo package discount special! TCO-CIPTS is a subset of CTNS. CIPTS concentrates on the fundamentals concepts and technologies of the new‑generation MPLS+IP+Ethernet+fiber telecom network, leaving out the PSTN and wireless courses. A CIPTS is up to speed in new-generation telecom network technologies. You willl learn the OSI layers, Ethernet, MPLS as a traffic management system for IP Packets; IP Addressing and Routing (Layer 3); Optical Ethernet and MAC frames (Layers 2 and 1) and how they all fit together. A TCO-CIPTS has knowledge of the MPLS-IP-Ethernet structure and understands operation of the network. This solid telecom base gives a CIPTS the ability to get up to speed on certain projects, and have the versatility to work on many others. An excellent way to show your potential as a new applicant or when climbing the ladder at your place of employement. CIPTS is obtained by passing the Exam, 4 individual course exams, each with 10 multiple-choice questions. In addition to your certification and certificate, you also get a personalized Letter of Reference that lists all of the areas you are knowledgeable in, and inviting the recipient to contact us. The CIPTS Certification Package Unlimited Plan includes the courses and CIPTS Exam, with unlimited repeats: guaranteed to pass, refresh your knowledge anytime. Get all of the knowledge you need for the new-generation MPLS-IP-Ethernet telecom network within these four courses – plus TCO Certification to prove it! TCO Telecommunications Certification is the confirmation that an individual has obtained specific knowledge of telecommunications, VoIP, SIP, IP networking, datacom, MPLS and wireless telecommunications technologies, the network. Taking courses to receive a telecommunications certification is a perfect way to help prepare for a career in the field of telecommunications. Whether you're a programmer looking for that extra edge or trying to build a broad knowledge in telecommunications, the networks and the many services and technologies, a TCO certicification can help. You can be an employee in sales, marketing, finance, management who is involved with the company telecommunications. These certifications will bring you up to speed on the telecom knowledge you need to be a success at your job! The high-quality online courses are delivered in Google Chrome or Puffin browsers on desktop or laptop, tablet or phone, Windows, Android or mac... to any number of people, anytime, anywhere. Courses are organized into lessons. Stay on a lesson for as long as you like, move to the next lesson when you're ready. You can even go back! Take the course exam only when you're ready. With the Unlimited Plan, you can repeat exams as needed, and retake courses anytime in the future. Copyright © telecom-certification.org, All rights reserved.